Shredded bubble gum with a long lasting sour apple flavor. Out of all the flavors of big league chew you can buy kids seem to like the sour apple the best. Big league chew comes in cool foil pouches to help keep your bubble gum fresh in between chewing it. 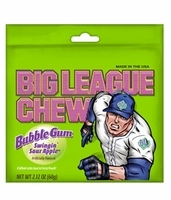 The younger kids love buying big league bubble gum as it makes them feel like baseball players. Each package is 2.12 ounces of fruity chewy fun.